Upon seeing Greek pottery art at a museum last year, I remarked to a friend that this would make a cool video game. “Someone is totally already doing exactly that,” he replied. I’m glad someone had the idea way before me and had the skills to execute it so well; the characters and environments of Apotheon’s Metroid-inspired creation are beautiful and you can even see the subtle texture of a handmade pot on every screen. Apotheon delivers on more than great looks. It starts with head god Zeus abandoning humanity and convincing the rest of the deities to do the same. Without the benevolence of the gods, the Earth will wither and die along with all of the people residing on it. Our hero Nikandreos teams up with Zeus’ spiteful wife, Hera, to take on the gods one by one and gain their upgrades along the way. Comparison’s to Sony’s God of War series are unavoidable since they draw from the same pantheon, but they’re so different in tone, look, and gameplay that the similarity is not a factor. Combat works somewhat like a twin-stick shooter, with movement on the left stick and analog aiming on the right. Melee battles involve trading high, medium, and low shield blocks with similarly diverse overhead strikes, thrusts, and low hacks. Arrows and other projectiles offer both precise aiming and quickshot options. This balance of attack and defense offers a light strategic edge to fighting, but encounters are simple enough to be able to hack away at weaker enemies without a lot of fuss. You can’t just pick one strategy and stick to it, since weapons have a limited durability. I was constantly switching through swords, spears, axes, and clubs due to breakage. While this created offensive variety, I stuck with a collection of ho-hum, medium-quality weapons 90 percent of the time, saving the big guns with special traits for boss battles. You can access your entire inventory at all times, so equip the right tool for the job is easy – like a long spear to stab ceiling turrets, a crap sword for slashing item crates, or a trident for stabbing pesky mermen. 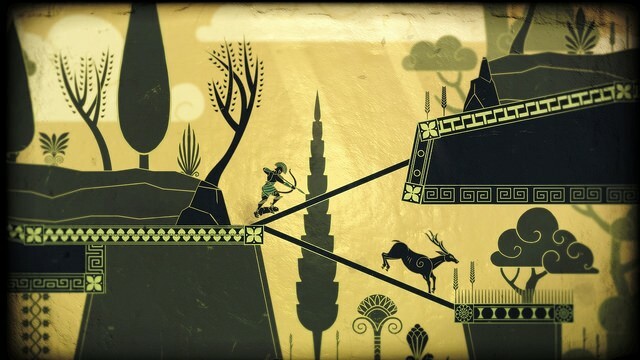 What impressed me most about Apotheon is the variety and constant freshness of the levels. Every stage is built completely around the theme of its associated god. Poseidon’s area has an ocean to sail around in, allowing you to visit dungeons on various islands or swim around in underwater cave networks searching for hidden treasure. Ares’ temple is soaked with gushing blood rivers, and its berserk inhabitants are forced to kill each other constantly. Athena resides in a massive spinning labyrinth loaded with traps and clever puzzles requiring dexterity and brain power. My favorite area is Artemis’ forest, which is populated with rare creatures to hunt topped off with a creative boss battle. As part of a hunting challenge, you take turns as the hunter and the hunted, trading off between human and deer form. The constant shakeup in themes prevents things from getting stale and always had me looking forward to the next surprising stage. Thanks to the excellent map system, an important part of any Metroid-style game, it’s easy to get around. With a quick button tap, a translucent map overlays the action and you can still move your little icon around the screen. I used this while clearing out the fog of war, zipping to a new objective, or trying to see the larger scope of a puzzle. Enemies can still attack you, so you should return to normal view for battles and fine-tuned jumping. I did have a few issues during my playthrough, however. During the Poseidon boss fight, he knocked my ship off the screen (a key component in taking him on) and I had to restart it a couple times before everything worked correctly. This along with a couple other small problems will hopefully be patched as soon as possible. Apotheon also includes a two-player local battle mode. With more players supported, more maps, and added options this could approach Towerfall-style multiplayer mayhem, but with it’s sparse current offerings there’s nothing to keep you coming back. For me, the rich single-player experience was more than enough. 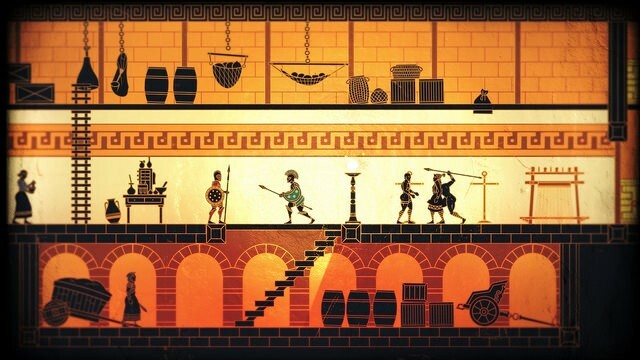 Not only is Apotheon a tireless devotion to ancient Greek art and culture, it’s also a damn fun game and one of my surprise early favorites of 2015. 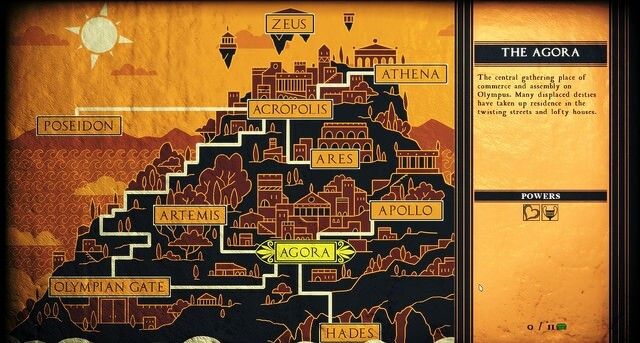 Apotheon looks great, but does it have the gameplay to back up the art?